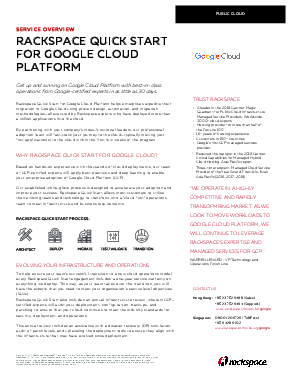 Rackspace Quick Start for Google Cloud Platform helps enterprises expedite their migration to Google Cloud using proven design, automation, and migration methodologies—all executed by Rackspace experts who have deployed more than a million applications into the cloud. By partnering with your company’s cross-functional leaders, our professional adoption team will fast-track your journey to the cloud—typically moving your first application(s) to the cloud within the first few weeks of the program. This annual review includes an assistance with a disaster recovery (DR) simulation, audit of patch levels, and upl eveling the deployment tools to ensure they align with the infrastructure that may have evolved since deployment.